This year’s Salon Auto in Geneva will be remembered as the one where electric concept cars got finally replaced with production models. The transition has been years in the making, around ten or so in fact, but never did it get so evident as this time. I first wrote about Geneva’s trends a few years back, and momentum in the field has since been steadily picking up pace, albeit not as quickly as it could have been. This was mostly due to legacy automakers’ reluctancy in betting on electric cars’ technological challenge and letting go of the century-old internal combustion engine. It resulted in year after year of juicy press releases and one-off seductive concept cars with little or nothing to show under the bonnet. All the big names got in the business of “vaporware” – VW Group, BMW and Mercedes among the most prolific – trying to get the highest possible attention with minimum financial effort. So, as no money was being spent on research and development, a lot of PR effort helped them create a blurry vision of something 5 to 10 years away. But times have changed, and while early EV entrants such as Nissan inexplicably sit on their laurels after investing heavily to be the first on the market (with 2011 Car of the Year winner Leaf), other companies have taken over to help fuel the fire and shake the market. If the EV spotlight this year is on Europeans and Asian established car manufacturers, the obvious reference is to Tesla, whose historical advent in the auto industry cannot possibly be overestimated. Elon Musk’s company and its relentless progress in developing compelling, sporty electric cars and related infrastructure over the years is what forced the likes of VW Group, Jaguar, Mercedes, BMW, Hyundai etc. to weigh in and show off their own vision of the future, this time to great effect. So what happened this year that is so different? This time we have production models ready to be sold in 2018, in the present rather than the future. The choice of segment and their specs are also at the core of this shift. Manufacturers are focusing on the popular crossover style (now ubiquitous in all car segments) and they are doing so while packing a punch: high power, fast charge and long range. Three models stole the show more than any others. Where to start? 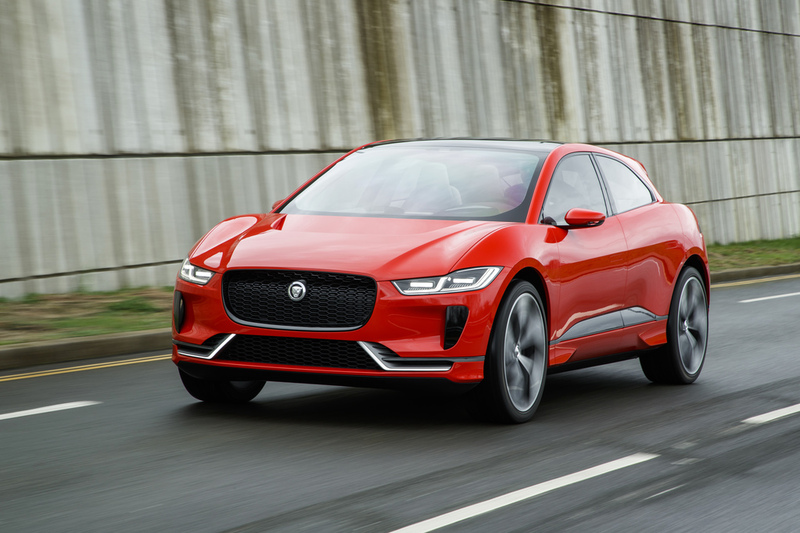 Probably with Jaguar’s new I-Pace, repeatedly teased at recent auto shows in concept format, it is now finally available as a production model with a 90 kWh battery capable of around 480km (300 miles) WLTP range and sportscar acceleration (0-100 kph in 4.8 sec). As importantly, 100 kW CCS type charging is available, which means this model will be able to take advantage of a quickly growing fast charge infrastructure, particularly in Europe. Specs aside, the looks of this luxury crossover are beautiful and have been widely praised by the press, which will significantly help the EV cause at large and the sales for this particular model. True, some details may have been better: fast charging is projected to reach 150-350 kW within a year or two, and a longer range option would help. But we are now talking about an electric car that will be suitable for nearly everyone (so long as they are prepared to pay well over £60k), with little downsides compared to similar ICE cars in terms of usability and fun. Jaguar’s effort is sure to be rewarded and we expect more from the brand in the future. Another electric production model is perhaps more important than Jaguar’s. That’s the Hyundai Kona Electric, a compact SUV (4.18m long) which comes almost out of the blue, as Hyundai never got behind battery electric cars till last year with its Ioniq Electric short range model. 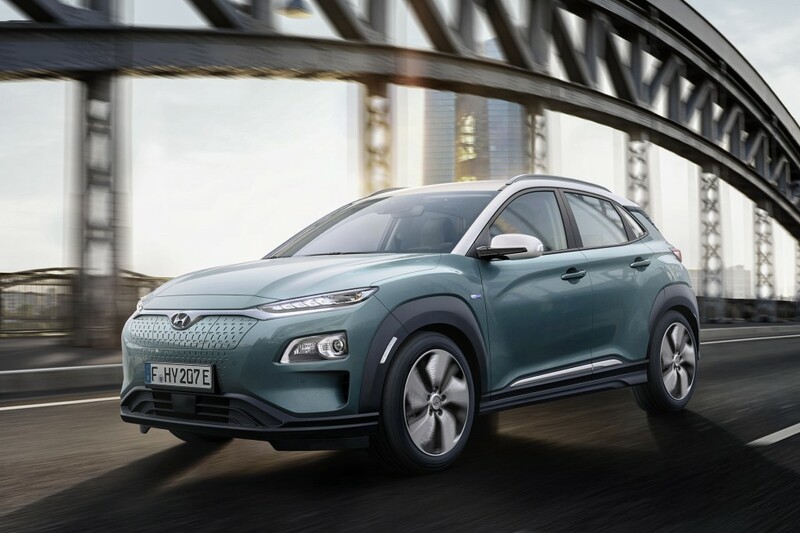 The Kona Electric is the world’s first affordable electric SUV and comes in two versions which are well positioned at 39 and 64 kWh battery options, with around 310km (194 miles) and 480km (300 miles) of range respectively under WLTP cycle. Price is yet unknown but expected to be affordable. With 100kW fast charging and up to 150kW motor with 0-100 kph acceleration in 7.6 sec for the more expensive option, the Kona Electric may become a best seller and likely to steal market share from the Nissan-Renault group, the world’s leader in the electric car market. More importantly, the Hyundai-Kia group is now moving aggressively to position itself in the electric car segment, with more models to come including the Kia Nero EV, recently shown at the Last Vegas CES. Last in the count of notable production EVs at Geneva is the Audi e-tron Quattro. While still not an actual production model, the prototype displayed in Geneva is as close to a production version as it gets, the peculiar colouring being the only clue that the car is not yet for sale. This premium SUV with 320kW power output will debut later this year and is already available for pre-order, for a price starting at €80.000 in Europe. 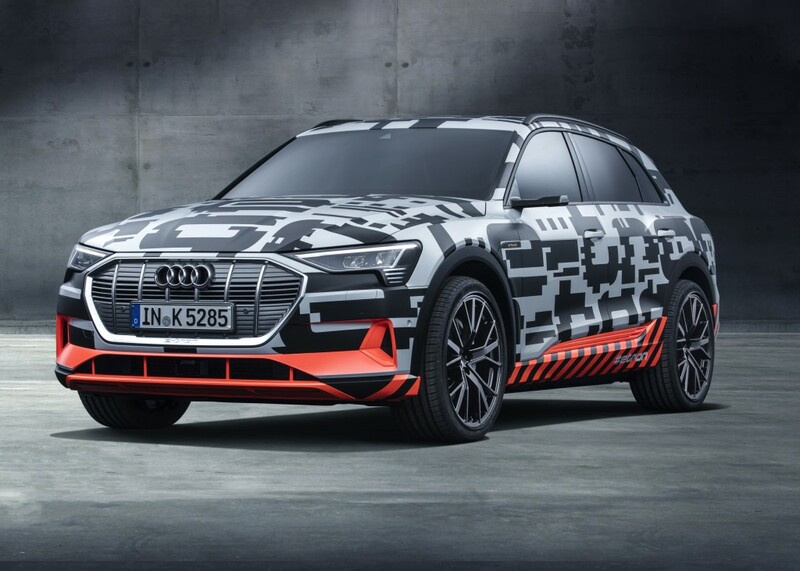 The 95 kWh battery should give it a WLTP range of around 480km (300 miles), while 150kW fast charge capability is perhaps the most noticeable feature as it will place the e-tron above even Tesla cars’ 120kW charging standard, currently the fastest in the world. Importantly, this is the first production car designed from the ground up to be electric by the VW group, which also unveiled its umpteenth concept car, the VW I.D. Vizzion EV, as well as Porsche’s Mission E Cross Turismo concept, possibly ready for 2019 production. Several more production and concept electric cars made it to show this year, helping the EV scene reach critical mass in exponential fashion. This shift is unstoppable, the time for vapourware and press releases has finally come to an end. Fasten your seatbelts, the EV game is on. This entry was posted in Clean Energy, Green Cars. Bookmark the permalink.